Ten million people in the UK – one in six of us – have some degree of hearing loss. The main causes are hereditary factors, noise exposure, trauma and ear diseases. And, of course, there is age. Like getting fatter and going grey, we tend to think of hearing loss as an inevitable part of ageing, and it is certainly true that as you get older your hearing tends to get worse. More than 40% of people over 50 have some degree of hearing loss, rising to 70% of those over the age of 70. The good news is that there are things you can do to about it. The bad news is that there are potentially serious consequences if you choose to ignore hearing loss, including an increased risk of dementia. How does having poor hearing affect people? I have a very personal interest in this as my hearing isn’t as good as it used to be. When I go into pubs or restaurants with lots of reflective surfaces I struggle to hear what is being said. Unlike my children, who are happily shouting at each other, I sit there, perhaps catching one word in three and pretending to follow the conversation. For many people, gradual hearing loss is far more than an inconvenience: it can lead to social isolation, which in turn can contribute to mental health problems such as depression. And there is also mounting evidence that hearing loss can significantly increase your risk of developing dementia. So it’s really important that you don’t ignore it. Yet on average, people in the UK wait for a staggering 10 years before they seek treatment. According to the charity, Action on Hearing Loss, only around 40% of people who need hearing aids have them. This may be because their GP hasn’t referred them to an NHS audiology service, or because they are worried about being given a large and very obtrusive hearing aid. What are the signs you’re having hearing problems? Although hearing aids are far more discreet and effective than they used to be, many people are still reluctant to wear them. Another reason why many people don’t get treatment is because they simply don’t notice that their hearing is declining. It’s surprisingly tricky to spot gradual hearing loss as our brains are very good at compensating, so we’re not even aware of how much we’ve lost until things are quite far advanced. • Denying you have a problem! 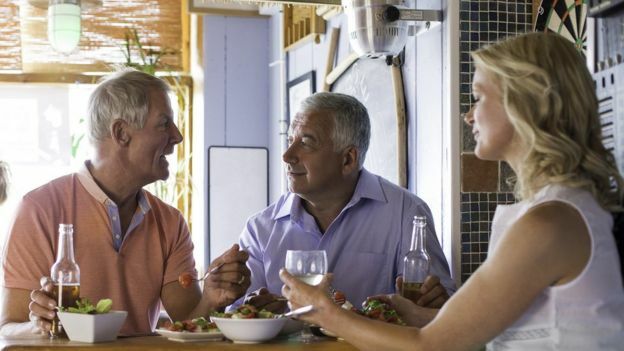 Auditory neuroscientist Dr Jennifer Bizley says that one of the ways people get round the problem of hearing loss is by relying on one of their other senses, vision, far more. “We used to think that dedicated bits of the brain did hearing, and a separate bit did vision, and only later was that information put together. “Now we know that actually there’s cross-talk between the senses at a really early stage, and one of the things that we think that information could be doing is helping you in situations that are difficult, like listening in a noisy restaurant. The effects of hearing loss on cognitive skills and memory can be quite profound. But the encouraging thing is that if you correct the hearing loss you can prevent the cognitive decline. A recent study by Johns Hopkins researchers in the US, which compared intervention with non-intervention, showed this quite clearly. So although there’s no cure for age-related hearing loss, there’s plenty you can do to help improve things. The important message here is if you think your hearing’s deteriorating, don’t delay: get help from your GP who should be able to rule out any temporary causes and refer you for a hearing test, if you need it. The new series of Trust Me I’m a Doctor continues on BBC2 at 20:30 GMT on Wednesday 10 January and will be available on iPlayer afterwards. To arrange a hearing test with Hear Pure, you can call head office on 01244 311142, email on info@hearpure.com or call your local clinic. We’d be happy to help with a FREE quick hearing check.